This post ran originally on 23 May 2009 and I STILL think it's funny. 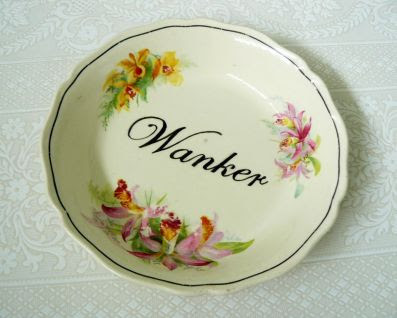 I hope the New Zealander behind this brilliant idea's still plugging away at her art somewhere. Clever and deliciously subversive, aren't they? 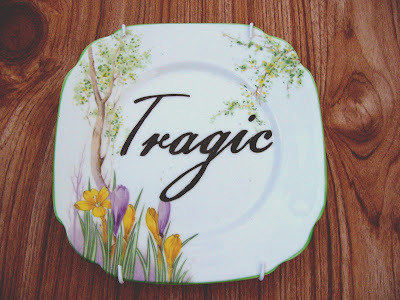 These plates are the handiwork of an artist who calls herself Trixie Delicious. Aukland, New Zealand-based Trixie sells her wares (and ships worldwide) through a website called Felt. Felt is the Kiwi version of Etsy, a marketplace for a group of independent artists and artisans to sell their work. Ms. 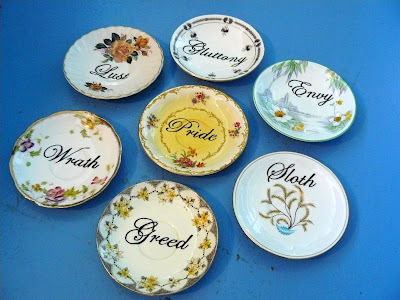 Delicious takes vintage plates, platters, saucers and bowls and hand paints her messages of good cheer on them directly. She uses non-toxic, heat-fused, ceramic paint. This means that these delightful, heartwarming iconoclasms will last forever. 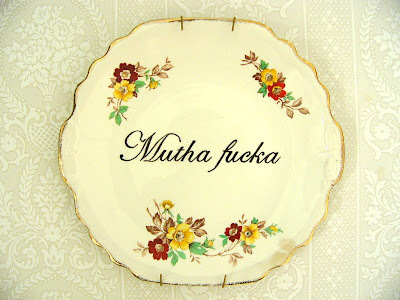 Imagine the joyous faces around your table when you serve a Thanksgiving turkey from a Crackwhore Tray. That noise you hear is the sound of my heart growing three sizes from the thought alone! Many thanks to Leona Gaita and her great blog Gaita Interiors for the tip off to these beauties. Spend some time this weekend getting to know Leona, I like her perspective. I want I want I want!! These are now on my Christmas List! Fantastic! Finally, we'll have something different to talk about at this year's Thanksgiving feast! I wonder what she charges for international shipping Cham. 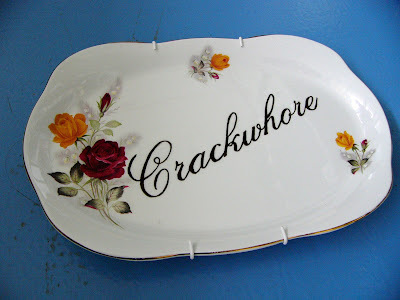 Leah: The Crackwhore serving platter would be the ultimate conversation starter. Don't you think? PERFECT to stir things up and add to the already massive turkey angst in my house over the holidays. Martha Stewart just ruined everything. May even get my teenagers into the conversation. Not just Thanksgiving either, imagine the joy they'd spread under the tree. Ha! Love them! Thanksgiving will never be the same. I've been eyeballing these things for over a year. One of these days I'll take the plunge.